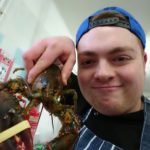 In Worcester city centre there are a fair few new independent restaurants that need every bit of support they can get, and a few that we haven’t got around to visiting yet. 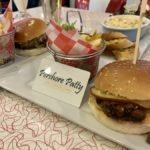 Mr R and I don’t usually go out of our way to eat at the chains as a rule, however there’s always that odd occasion where things don’t go to plan, and when this happens our trusted high street favourites are on hand to offer a safe option and some consistency. 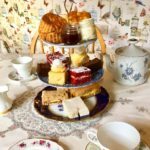 I talk more on this subject in my recent post ‘are our independent restaurants doing enough to keep us coming back?’. Restaurant chains definitely have their place in town / city centres, and some are actually pretty darn good. There’s a heart-warming story behind the first Bill’s Restaurant, which began very much as one man’s dream and as an independent business. 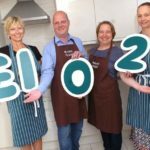 Once a greengrocers started by Bill Collison in East Sussex, the shop expanded into a café after a refurbishment following a flood. Fast forward 18 years and there are now nearly 80 Bill’s restaurants around the country. Today, and now as a restaurant chain, it is backed by Richard Caring and has recently appointed new CEO Mark Fox (former Starbucks UK Managing Director). We were invited by Crowngate Shopping Centre to try out Bill’s Restaurant on Chapel Walk, which I think first opened back in 2014 and was probably the last time either Mr R or I had eaten there. Our table was reserved for 2pm on a Saturday afternoon, which for us was quite late to eat lunch, but the timing happened to work out perfectly for the day’s plans. When we arrived the restaurant was surprisingly busy for the time of day and we queued for a moment or 2 as hungry shoppers were trickling in before us looking for a bite to eat. 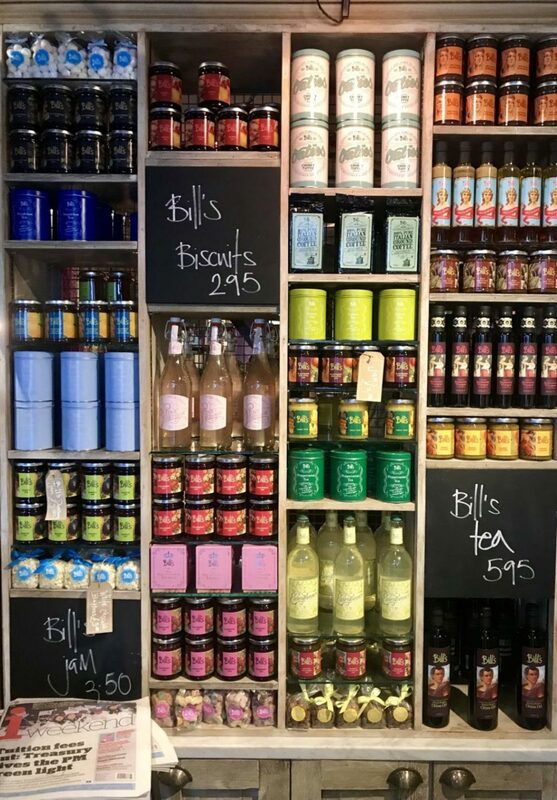 We had time to notice the shop in the foyer area filled with tea, coffee, jam, biscuits and sweets, rather than the fruit & veg that founder Bill had once stocked. I’ve since discovered that Bill’s have their own London dry gin too, which they didn’t seem to have available in the Worcester shop, otherwise we would have bought a bottle for our collection whilst we were there. We received a very warm welcome from restaurant manager Sarah, who took us to a spacious, yet intimate table in one of the restaurant’s nooks and passed us over to our server who was on hand to answer any questions. We got started with some soft drinks which were brought to the table with iced glasses and the Diet Coke was poured from a glass bottle – I don’t know why it makes such a difference compared to tap, but it just does. 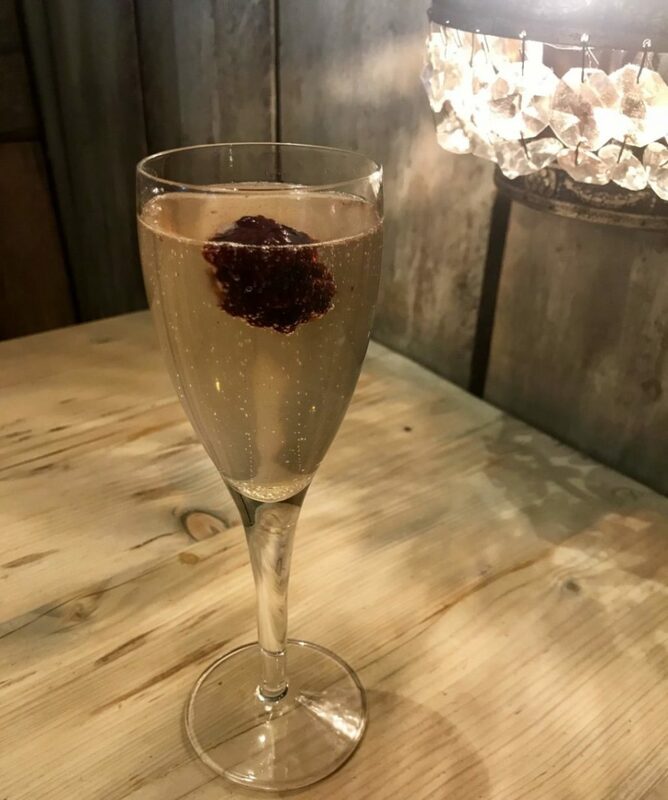 Whilst we waited for our food order we noticed the cocktail menu and I fancied trying the Hedgerow Fizz (£5.95) – a prosecco cocktail mixed with wild Sussex elderflower cordial, with a frozen blackberry garnish to add flavour, texture and a bit of fun to the drink. There is a very welcoming atmosphere and great vibe in the restaurant, although it didn’t seem to know what it wanted to be. Thinking back to the tea, coffee, jams and sweets for sale in their shop that we saw on the way in, it was a contrast to the rustic Italian style restaurant décor with industrial pipes on the ceiling, and to the modern British style food offer on the menu. This really isn’t an issue at all, more something that we found interesting and we actually quite enjoyed the quirkiness. 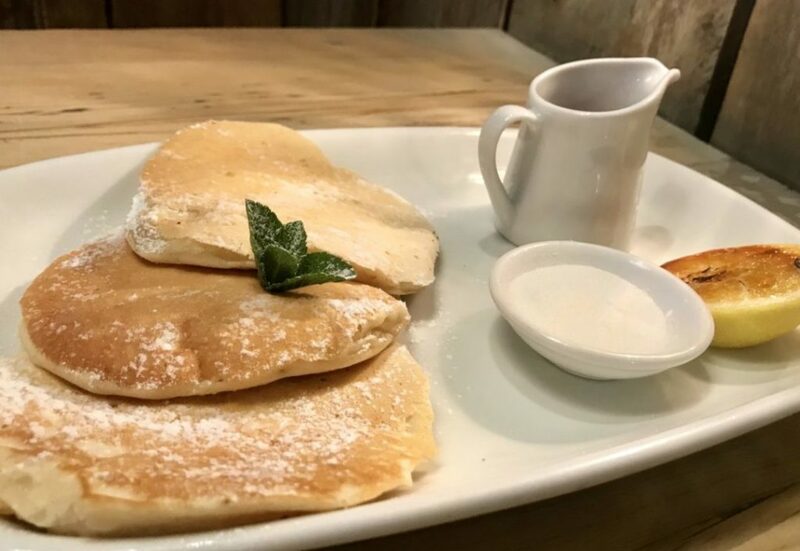 Our visit was a week before pancake day and a leaflet on the table was promoting a choice of pancakes available up until the 13th February. The leaflet design was in an art deco / 1950’s or The Great Gatsby style theme, which I happen to be a big fan of and it made me want to order one later for us to try, especially as they were only on offer for a limited time. 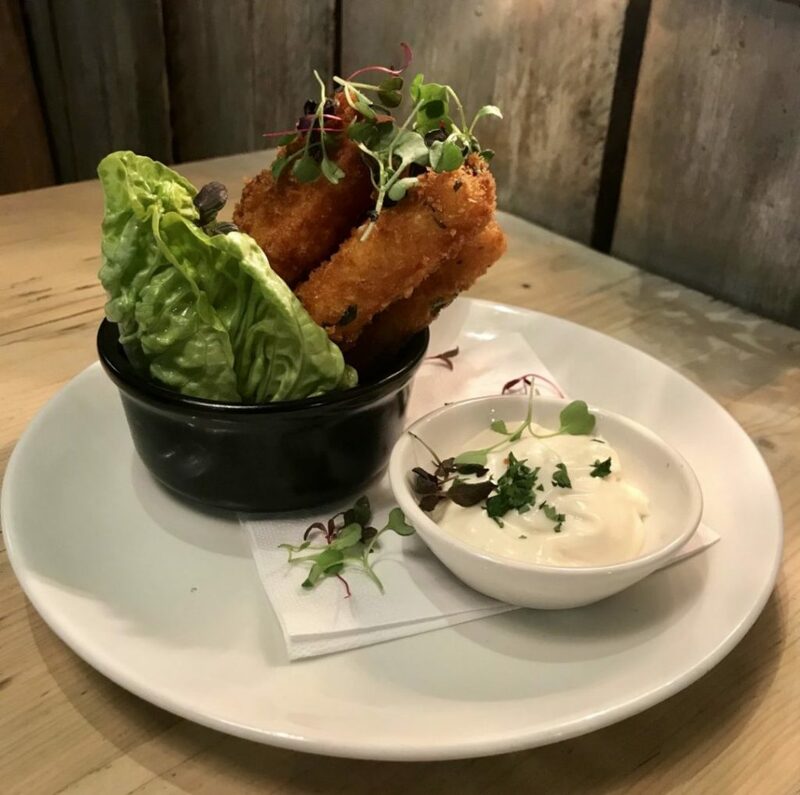 The crumbed halloumi sticks (£5.95) were the first thing both of us spotted on the menu and they were nothing short of incredible. The cheese inside was hot and almost on the verge of melting, but not quite. It had all of the lovable qualities of a mozzarella stick, but they were far superior. 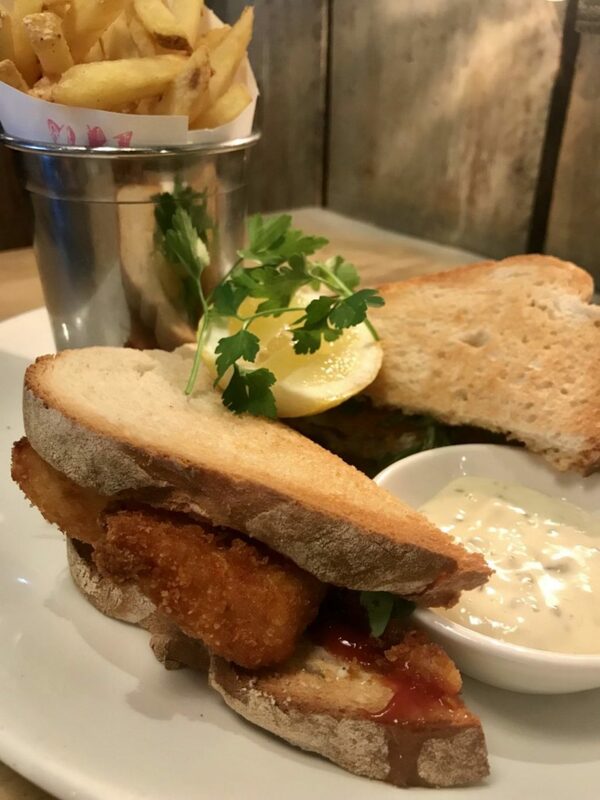 The halloumi had been cut into fish finger sized slices and crumbed before being fried and served with garlic and lemon mayo. Cheese lovers you will not be disappointed. Our second starter choice (selected with a little help from our server) was the Bill’s smoky Italian flatbread (£5.50). The toppings were smoky and spicy, but not over powering. We could have taken more heat and maybe I’d have preferred the crispy onions to be caramelised for a softer texture, but the bread is a great sharing starter choice for the table, especially if you’re eating in a group. They also do a garlic, herb and cheese vegetarian option or if you’d prefer less smoke and heat. I’d tried the burger when I came to Bill’s when it first opened, as did Mr R. This time I went along with the fish finger sandwich (£9.95), which also got a nod from our server who suggested it was a favourite. My first observation when the sandwich arrived was the skin-on fries looked really good. I often find disappointment when I get fries that are undercooked, pale and soggy or over cooked, burnt and crispy. These fries were just right. I failed to notice the rocket leaves when I read the menu, so I apologise to the kitchen for picking them out, I just can’t seem to get past the peppery taste. Inside the toasted white bloomer bread a coating of mayo and ketchup sealed the sandwich together. 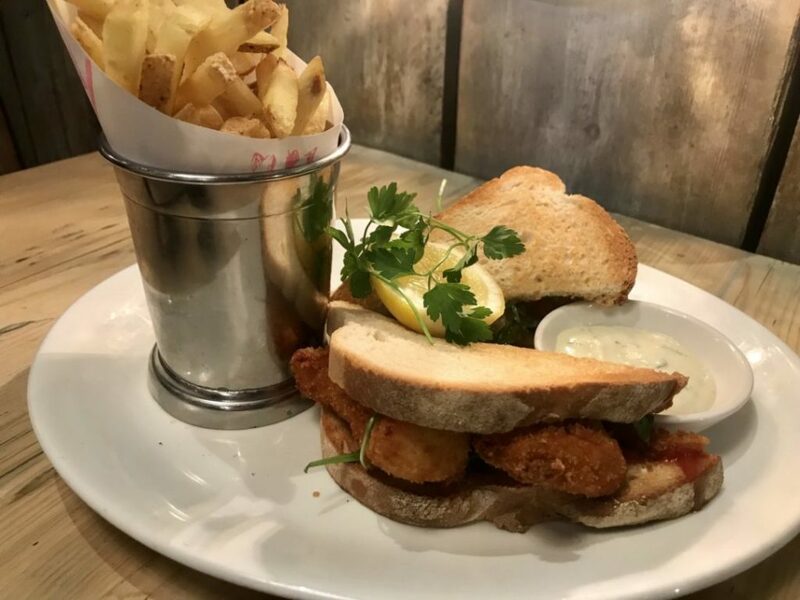 The fish was cod and had been coated in panko breadcrumbs – a much welcomed alternative to the greasy batter which really only has a place in a ‘chippy’. On the side was a pot of tartare and a wedge of fresh lemon for squeezing. I could see why this was a popular choice for Bill’s diners and I’d definitely go back and order it again (along with a portion of halloumi sticks, obviously). Mr R went with a heathier option as he had a craving for chicken – I blame the hangover. 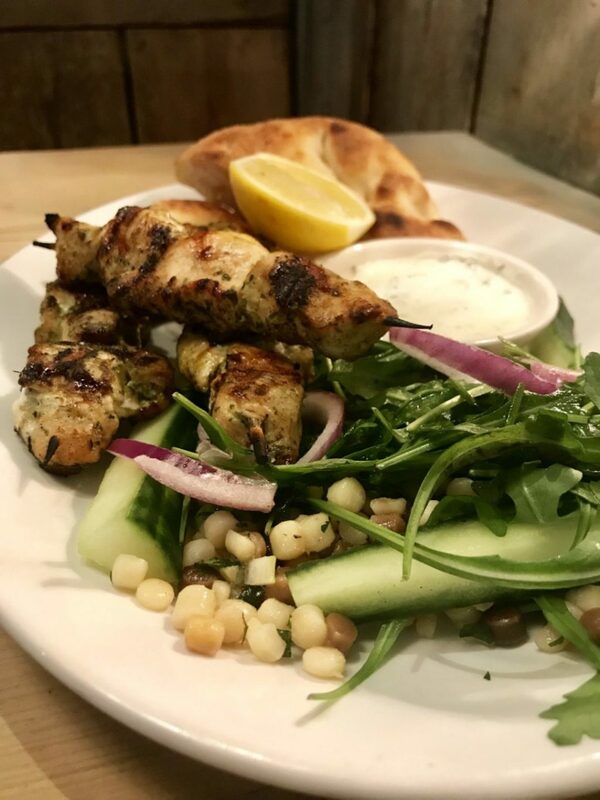 The Mojo marinated chicken skewers (£11.25) were served with toasted fregola (a type of pasta), which we found to be a more unusual accompaniment to the giant cous cous that sometimes makes an appearance on similar dishes. Bill’s clearly have their own twist and way of doing things and it really works. The chicken had a chargrilled flavour, without being over done and came with a cucumber, red onion salad as well as some stone-baked flatbread on the side . Bill’s mild Mojo marinade recipe worked really well alongside the strong flavours in the mint, coriander and parsley tzatziki. The dish sort of had a Mediterranean / Moroccan look, but with a Cuban / Italian influence. I hadn’t forgotten about the pancakes and although we’d had more than we needed, the ‘glamcakes’ had to be done. The caramelised banana and salted caramel ice cream sounded amazing, but we went with the classic lemon and sugar pancakes (£5.95). They were served up thick and American style, but as with most things American it was too much to finish. The Bill’s twist was the caramelised lemon which was a great addition for a sweet dish. Unfortunately the pancake syrup was fridge cold and would have been a little more palatable had it been warmed or at least brought to room temperature. That being said, only a minor point considering the pancakes wouldn’t usually be on the menu and we had an enjoyable lunch overall. 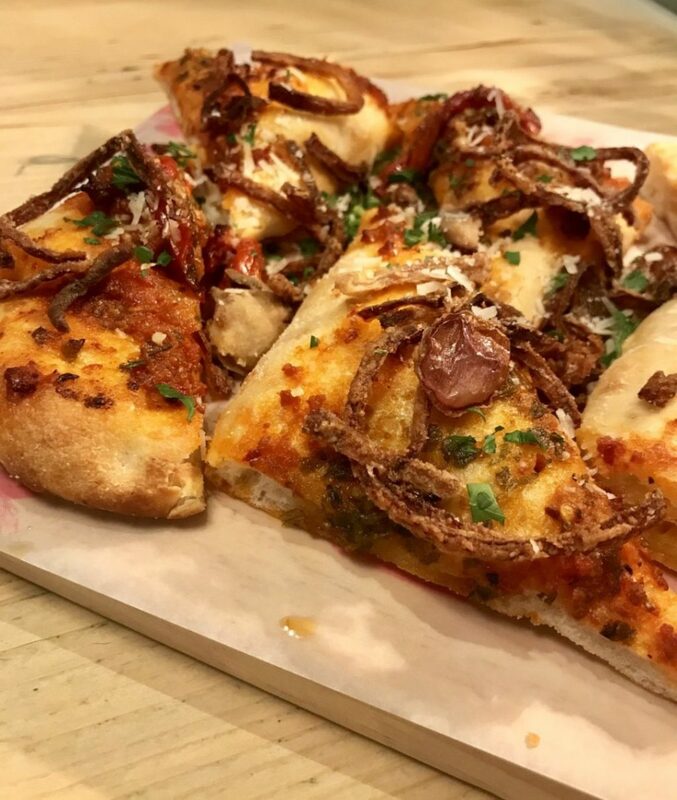 If you’re looking for a good choice of food and drinks served in a vibrant, busy atmosphere with music and funky décor, then Bill’s should be on your list of places to visit. *Although our food and drinks were complimentary on this particular visit, as ever my words and photos are my own. Thank you again to Sarah and to the whole team at Bill’s Restaurant, Worcester for hosting us and making us feel very welcome. Thank you also to Crowngate Shopping Centre for organising our visit.